Advertiser.ie - What's on in your community? 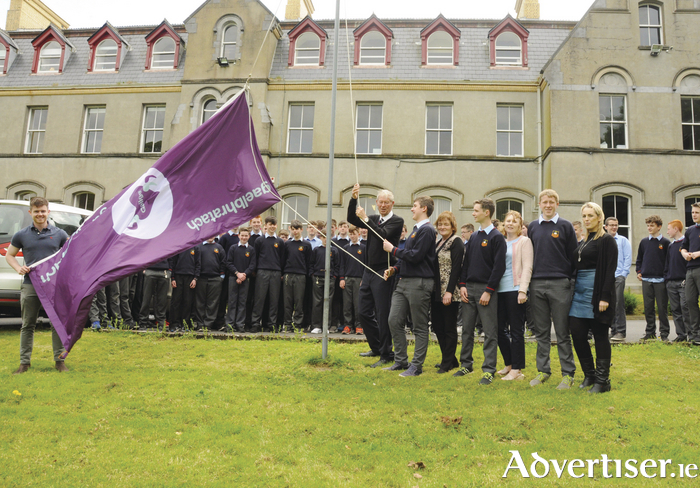 Micheal O Muircheartaigh on a recent visit to St Muredach's College raised The Gaelbhratach Flag. The college was awarded this flag for its efforts in promoting the Irish language within the school. Left to right: Sean Gaughan, Micheal O'Muircheartaigh, Conor Clarke, Angela Lavelle, Niall Judge, Sile Mc Andrew, Kenneth Healy and Maria Ní Bhedláin. Photo: John O'Grady. Every day of the week there are some great events taking place in towns and villages all across Mayo, check out what's going on this week. If you'd like something included in Community Diary, email: [email protected]. Weekly clean ups will take place on Tuesday evening meeting at the Bank of Ireland at 7pm. Any group who wish to adopt an area call to Áras Mhaolchiaráin, and the team can provide you with vests, pickers, gloves, and bags. Barnacarroll summer camp will run weekly summer camps for four weeks from July 3 to July 28. The multi packed activity camp caters for children from 2.5 years to 12 years of age and offers excellent value for families. Early booking is advised. To register call Teresa (087 ) 6488995. Balla Tidy Towns annual fundraising car wash takes place in the Square Balla Saturday, June 10, from 9am to 6pm. Mayo Roscommon Hospice is appealing for volunteers to help with sunflower days in all areas on Friday, June 9, and Saturday, June 10. Any time you can give would be greatly appreciated. Please call (094 ) 9388666 and help maintain local hospice palliative care services in your area. Belmullet Further Education Centre (over the Co-op ) is holding an open day on Thursday, June 15, from 12 noon to 3.30pm and from 6pm to 8.30pm. Go along and find out about full time and part time courses for September 2017. Light refreshments will be served on the day. For more information contact Treasa on (097 ) 20901. A common sense parenting course for children aged from two to five years will start on Wednesday June 7 and will be running for seven weeks, with the final session on July 19. The course will take place in the Castlebar Primary Care Centre, in room 111, Moneen Road, Castlebar, from 10am to 12 noon. The cost of the course is €20 for seven weeks. This skill based parenting programme teaches parents practical and effective ways to increase their children’s positive behaviour, addressing areas of child development, nurture, positive discipline, and communication in a supportive group setting. Contact Mary Everard for booking a place or further information (087 ) 2601283. Next Thursday June 8 will be the last music/poetry circle meeting before the summer break, the meeting will take place in Ballina Library from 3pm to 4.30pm. On Tuesday, June 20, the group will be having a day trip to Erris and the surrounding areas with a meal in Belmullet on the way home. The last group table quiz of the current term before the summer break will take place on Wednesday, June 21, in the Pastoral Centre and will commence at 2.15pm. The group will close for the summer on Thursday, June 29, and it will re-open on Thursday, September 7. Balla bingo continues every Monday night at 8.30pm in the Resource Centre. Unislim takes place in Balla Resource Centre on Thursday evenings, 6pm to 6.30pm for weigh and go, 6.30pm to 7.30pm for the full class, contact Sharon on (087 ) 7917851 for more information. Yogalates continues on Wednesday nights at 7pm, for more information contact Ros Kirby on (087 ) 2617309. Home Instead is supporting the event Marigold Festival for the Active Retirement Ireland throughout Ireland. Mayo's event is to be held on Sunday, June 4 from 3pm to 6pm at the The Gateway Hotel, Swinford, in the form of a Sunday afternoon tea dance. Entrance will be €10 payable on the door. The group meets in the centre every Friday from 2pm to 4pm. This is a drop in facility and open to all older people in the community – go along, meet new people, make new friends. The annual Ballyglass Heritage Club Annual Rally will take place in Ballyglass on Sunday, June 4. This year's rally will be celebrating the centenary of Ford Motors. Lots of classic cars, modified cars, classic motorcycles, stationary engines will be on display - along with basket making, thrashing, vintage runs, and children's entertainment. Admission is €5 and children are free. Exam Mass for all Junior and Leaving Cert students will be held on Monday, June 5, at 7.30pm in Knock Basilica. Students can bring their pencil cases to have them blessed. For more information on this event, contact Andrea Lynch at [email protected]. The Róisín Tansey Trust Fund is organising a Tochar Phadraig 22 mile sponsored walk from Ballintubber Abbey to Croagh Patrick (plus the Reek optional ) on Saturday July 1 as a fundraiser for Róisín’s ongoing physiotherapy and treatment. Anyone interested in taking on the challenge can contact James Keane by phone/text on (087 ) 9622946 or email [email protected]. A parenting alone group will meet on Tuesday, June 6, at 10.30am in the Le Cheile Family Resource Centre in Castlebar, and it is hoped it will meet on the first Tuesday of the month after that, if you are interested go along or call (094 ) 9025126 for more information. Baby Bazaar; Indoor Baby & Toddler Market, and Cake Sale, being held on Sunday, June 4 from 10am to 2pm, in The Kennedy Glasgow Centre, (opposite Crockets restaurant, ) Quay Road, Ballina. Buy and sell preloved/new merchandise, toys, clothes, shoes, maternity wear, cots, prams, and other good quality items. Admission is €2, children free. Free Tea/Coffee. €10 to book a stall to sell items, to book call (087 ) 3518794. In aid of the Over 55 Club, Ballina. Kilmovee's pop up restaurant is back on Friday, June 23, in the beautiful Thatch Cottage. It costs just €25 for three courses and it is a bring your own bottle. A €10 per person deposit is required and booking is essential. Ring the community centre on (094 ) 9649484 or email [email protected] for reservations. South West Mayo Development Company outreach clinic takes place everyMonday, from 10am to 1pm in Claremorris Family Resource Centre. Are you thinking of setting up your own business? Do you need advice with a business plan? Breda Murray (South West Mayo Development Company ) will be there to help and assist you with any queries you may have. Contact (094 ) 9377838 to make an appointment. The Monday friends group meets every Monday at 10.30am for a chat and a cup of tea. The parent and toddler group meets each Monday (except for bank holidays ) from 10am to 12 noon. The AIRC group meets on the first Monday of the month at 8.30pm, the GIY group meets on the second Monday of the month from 7.30pm to 9pm. On Wednesdays the creative writers group meets from 11am to 1pm, and on the second Wednesday of each month Outwest holds its meeting at 8.30pm. The breastfeeding group meets on Thursdays at 11am, and the knitting group also meets on Thursdays from 2pm to 4pm. For more information on any of these groups call the Le Cheile Family Centre, Tucker Street, Castlebar, on (094 ) 9025126 or drop into the centre. Castlebar Markets continue every Saturday in Castlebar Tennis Club, from 12 noon to 4pm. Lots of hand-made, home-made, and home-baked products on offer. Page generated in 0.1217 seconds.